Arizona: On October 16, 2010, at the conclusion of the Silk Road Tour coordinated by EWC alumnus Tim Wong, a check for $5,000 was sent to Gordon Ring, courtesy of the China Discovery Tours who donated $200 for each full participant on the tour. 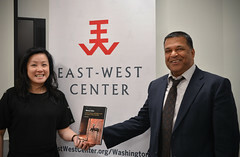 In addition, Tsue Ostemann, wrote an article about the tour experience, which may be viewed at the following link: http://forum.eastwestcenter.org/alumni/2010/11/02/ewca-silk-road-tour-report. ASDP: Recipient of the Best Alumni Chapter at the EWC/EWCA 2010 International Conference with several of its chapter attendees presenting papers in Honolulu, the ASDP engaged in the following activities for the last quarter of 2010: 1) Published a peer reviewed issue on the ASDP Journal, East West Connections: Review of Asian Studies, 2) maintained the Asian Studies Development Program listserv, ASDP-L, 3) developed and coordinated (via its relation with the ASDP Assoc. of Regional Centers for Asian Studies) the 16th Asian Studies Development Program National Conference 2010 in Honolulu and 4) under Julien Farland as editor, the Asian Studies Development Program’s Alumni Newsletter, was published this quarter. Brisbane: The Brisbane Chapter sent information on their contact person, their website coordinator and the current officers, board or committee members (contact the Alumni office for details). On September 12, the group organized a Hike to Help Nepal which supports their sister agency, the Nepalese-Australian Friendship Association. The chapter also got together for an end of the year potluck supper at the Webbs’ residence on December 12. After losing their bid to host the 2012 EWC conference, the Chapter is considering organizing a regional conference in mid-2013 around the theme of public attitudes toward climate change, to be participated in by research papers of formal academicians and a less formal seminar/presentation by editors, journalists, Jefferson fellows, APLP participants interested/involved in the popular press. Chennai: The Chapter is developing 2 programs: 1) With the collaboration of academic institutions, employers and interested agencies, effort has started towards organizing a Career Guidance Conference for city college students. 2) Extensive consultations with leading academics in the areas of the environment, public health, education and empowerment of weaker groups are ongoing, with the goal of organizing a workshop on pressing environmental issues facing the city of Chennai. On December 15 2010, Jefferson fellow Dr. Raghuvir Srinivasan (who was in Hawaii in November, 2010), delivered a well attended talk on “Musings of a Journalist- the UK & US Experience,” a joint effort delivered by the Chennai chapter and the ABS (Assoc. Of British Scholars). Students of media and journalism in particular, attended the event. Chicago: We appreciate the Chicago chapter for responding to the call for reports and for suggesting to their members that they engage in a spring project and participate at Chicago High School’s Career Day. With Noreen forwarding an updated contact listing of alumni in the Chicago area to Pam, we expect that the Chapter members will actively and positively respond in the near future. Hawaii: The Hawaii Chapter reported their partial list of activities: 1) members meet regularly at the EWC on a monthly basis. 2) ProLink, the Chapter’s Professional Linkage Program, is ongoing. Each semester, the Program’s Committee of alumni and participants hosts a social event, so both groups can meet “their match”. By shadowing the alumnus, a participant experiences firsthand, the work environment and culture of the alumnus. 3) Last December, the Chapter’s fundraising project at the EWC Christmas Fair, coordinated by Itsuko Suzuki, was as in the past, a success. 4) The annual fundraising dinner at the Pacific Club is currently planned. The Chapter is thankful for the tremendous community support for this yearly project, thereby funding travel scholarships for 4-5 EWC students. Likewise, at this event, the Chapter will give an award to the EWCA-HI alumnus who has served the Center and the Association above and beyond the call of volunteerism duty. Finally, reported at the previous meeting, the Chapter reiterated the August annual “networking” picnic event at Kapiolani Park attended by over 175 incoming EWC students and alumni. Hyderabad: The Chapter continued its monthly medical camps with the cooperation of volunteer doctors, drug companies donating free medicines and high school students who oversee the patient queues. Likewise, the chapter held awareness programs on Aids and other diseases among the villagers. Their next goal: arranging training programs for school students to improve their English language skills. Jakarta: The Chapter submitted photos, the names of their Chair, Liaison, Current officers, board and committee members (contact the Alumni office for further details). On Facebook, the Chapter’s EWCA Kalea may be viewed at: http://www.facebook.com/EWCAlumni#!/profile.php??id=100000171931182. Via Yahoo, http://groups.yahoo.com/group/kalea/. Activities of the Chapter included: KALEA breaking of the fast in September, Bi-monthly chapter meeting in October & December, Retirement farewell in November for Dr. Irid Argoes, EWC Representative for Indonesia. Chapter member Jusuf Sutanto, is coordinating with Indonesian scientists, writers, thinkers to contribute to his book The Dancing Leader, which started from a seminar to commemorate the EWC Golden Jubilee. Kathmandu: We appreciate the Kathmandu chapter for responding to the call for reports. The Chapter had no activity to report for this quarter. Ambassador to the US and EWC alumni Shankar Sharma, was in Kathmandu for several days during the quarter. Kansai: The Chapter submitted a photo, the names of their Chair, Contact Person and Current officers, board or committee members (contact the Alumni office for details). The next general meeting of the chapter is scheduled for spring, 2011. No official chapter activities occurred during the last three months. 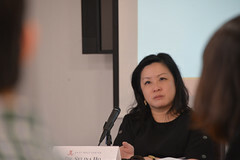 In December, 2010, as EWC alumni are also UH alumni, Seiko Furuhashi was appointed member of the Planning Committee of the UH Alumni Association in Kansai and the December 9th meeting likewise selected liaisons to the Japan American Chamber of Commerce in Kansai and the EWC/EWCA Kansai chapter. Karachi: We appreciate the Karachi chapter for responding to the call for reports. With Dr. Mehtab Karim back in Pakistan, the Chapter will propose new efforts to reactivate the group for 2011. Korea: On January 21st, 2011, the EWCA Korea Chapter and Korea Chapter, University of Hawaii Alumni Association (UHAA) will jointly hold a 2010 Year End party and share both organizations alumni resolutions. The younger UHAA Korea chapter has the involvement of younger UH graduates supplementing the EWCA Korea chapter with its senior alumni who provide assistance and direction to both groups. The chapter hopes to continue cooperative efforts with both groups in furthering EWC activities. Lahore: With the worst flood ever to face Pakistan and extreme human suffering of over 20 million people, the Lahore chapter had considered the situation of utmost priority and had been busy since September, actively soliciting help from the public philanthropy of individuals and civil groups. Via consensus, the chapter decided that each member focus on areas/issues where they have the most connections. The success of the strategy was evident when communities actively responded and were highly motivated toward the goal of rehabilitation (with the help and advice of the chapter). The Chapter leader visited worst affected areas in southern Punjab and has personally made donations of medicines, tents, clothing, bedding equal to US $2,500. Malaysia: We appreciate the Malaysia chapter for responding to the call for reports. No projects to report for this quarter. Mumbai: We appreciate the Mumbai chapter for responding to the call for reports. Members of the chapter requested that they don’t meet over the monsoon, as commuting to the meeting venue is difficult. The monsoon departed not at the beginning of October, but lingered till November at which time, the famous festival season in India commences. The Chapter hopes to meet in early 2011. Ontario: After the EWC 50th Anniversary Conference, the Ontario chapter added new members to their group. The Goggle group is the Chapter’s main medium for keeping current online social media. A speaking event set during the Fall of 2010 on internal climate change policies and Canada’s aspirations to meet international climate based obligations had to be re-scheduled for the 1st quarter of 2011. The Ontario chapter this summer started an ongoing conversation with the South Korea EWCA Chapter on a jointly operated and funded scholarship. To date, the chapter initiated groundwork for potential scholarship by reaching out to the South Korean Government’s Education Funding Department at their Consulate in Toronto and to a representative of the Ministry of Education from Ontario province. Singapore: The Singapore chapter maintains contact with EWC alumnus from other countries who are working in Singapore. In April 2010, the group supported two events: 1) April 13th: after a dance performance by EWC alumnus Garrett Kam at the Asian Civilization Museum, a fellowship dinner with the EWC Singapore alumni followed. 2) April 22nd: two members of the Chapter supported the Fulbright Association at their annual dinner meeting. Four members of the chapter attended the July EWC Conference in Honolulu. In September and October, the chapter had dinner meetings with Garrett Kam who passed through Singapore and in November, with Indonesia’s Jusuf Sutarto. Sri Lanka: The chapter held 2 board meetings for this quarter. The first meeting invited returnees from the EWC so they can engage in chapter activities. The response was poor and was exacerbated by the resignation of the VP due to poor health. On September 9th with the visit of Mary Hammond and Karen Knudsen to Sri Lanka, 37 participants attended a program held at the auditorium of the US-SL Fulbright Commission. On June 11, 2010, the chapter celebrated the EWCA 50th year anniversary celebration at the auditorium of the US-SL Fulbright Commission. Former EWC alumni and the Government of Sri Lanka’s Deputy Minister of Finance & Planning, Dr. Sarath Amunugama, forwarded a congratulatory proclamation and delivered the keynote address on the EWCA contributions to Sri Lanka’s society. Hopefully, with the updating of the EWC alumni list, the formation of an SL Regional Chapter (Kandy Chapter), establishment of a web site coordinator, nominating GBA Fernando as president of the Chapter Leaders Workshop and identifying a community service project – the Chapter hopes to motivate the alumni to positively reactivate chapter activities for the future. Taiwan: The Chapter was formerly identified as a liaison chapter because it was inactive. 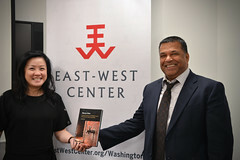 Their report asked whether they should change their status to an official chapter as the Taiwan chapter was reactivated on April 18th, 2010 under the new name: East West Center Alumni Association Taiwan. The chapter President is Yu-Jen Kao and Dr. Tien-en Kao, the Secretary General. Eight Chapter members attended the EWC 50th anniversary in July 2010. The 2nd Governing Board meeting was held on October 6th. In the near future, activities planned by the chapter would include lectures by EWCAT members to a general audience in Taiwan on issues promoting peace and harmony. Washington DC Capital Region: The Hospitality Committee Chair of the Washington, DC Chapter was responsible for the following invitations extended to the East West Center DC based Visiting Fellows: 1) an invitation to a neighborhood community Halloween event and 2) an invitation for Thanksgiving dinner at the home of the Furgal’s. With the departure of three of the four EWC Visiting Fellows (hosted at a September reception by former Ambassador Dave Kaeuper’s Shenandoah Valley Farm last September), two or three Visiting fellows will be in DC this month. Mary Jo Furgal will be in touch with the EWC Washington DC office about extending Chapter hospitality to them. The Chapter Development Committee thanks all the chapters that responded and hopes to hear from the other chapters in the near future. As we can glean from these reports, EWC alumni across cultures and countries are very much engaged in their communities and through their activities, have demonstrated a strong commitment toward the virtue of “service to others.” For instance, Karen Nunan of Brisbane has been helping with the Queensland flood relief work (areas submerged are the size of France and Germany combined) with the Red Cross. Our cumulative EWC experiences have without a doubt, promoted and enhanced activism and sensitivity toward the needs of the community in which we live. This entry was posted in EWCA Chapters and tagged EWCA Arizona Chapter, EWCA ASDP Chapter, EWCA Brisbane Chapter, EWCA Chennai Chapter, EWCA Chicago-Mid West Chapter, EWCA Hawaii Chapter, EWCA Hyderabad Chapter, EWCA Jakarta Chapter, EWCA Kansai Chapter, EWCA Karachi Chapter, EWCA Kathmandu Chapter, EWCA Korea Chapter, EWCA Lahore Chapter, EWCA Malaysia Chapter, EWCA Mumbai Chapter, EWCA Ontario Chapter, EWCA Singapore Chapter, EWCA Sri Lanka Chapter, EWCA Taiwan Chapter, EWCA Washinton DC Chapter. Bookmark the permalink. that I can be updated on activities of the Singapore chapter. BTW, this mail address was created at the East-West Center in the fall of 1999 on a Jefferson Fellowship.